Retired Jamaican sprint star Usain Bolt jumped in a sports car for two laps with Mercedes driver and Formula One championship leader Lewis Hamilton ahead of Sunday's U.S. Grand Prix. The fastest man in the world got in some laps with one of the fastest drivers in the world. And the result was the sprinter's legs feeling a bit like jelly. 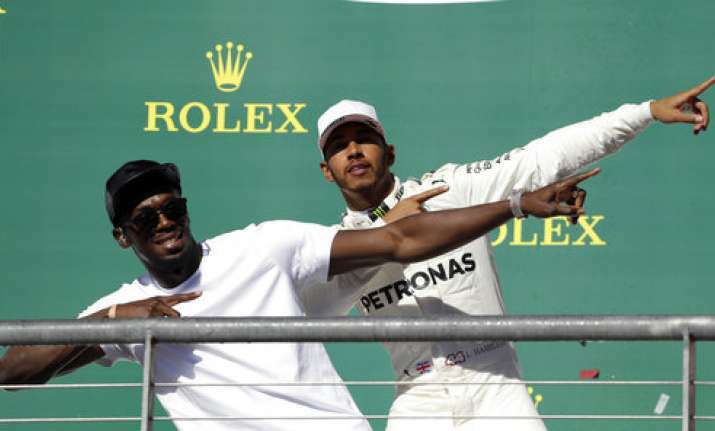 Retired Jamaican sprint star Usain Bolt jumped in a sports car for two laps with Mercedes driver and Formula One championship leader Lewis Hamilton ahead of Sunday's U.S. Grand Prix. Hamilton put Bolt and the car through sliding corners and spins, a performance that took Bolt's breath away. "I genuinely was not ready for that," Bolt said. "That was really stressful. He took the traction control off. I thought I was going to die." Hamilton laughed about the ride. "I was on the limit. We nearly crashed several times. I wasn't watching where I was going. Don't do that at home," Hamilton said. Bolt was designated the official starter for the race. He said he's rooting for Hamilton to win a fourth career driver's championship. Before his laps with Hamilton, Bolt said he's impressed with the fitness of F1 drivers. He said Hamilton has told him about the endurance running and gym workouts he does to stay fit.